OLDRIGHTIE: Now Here's A Nightmare Nobody Mentions. Now Here's A Nightmare Nobody Mentions. Bet The Remain Gang Have Millions Hedged For This. What will actually happen if we stay in the EU and has already been agreed. 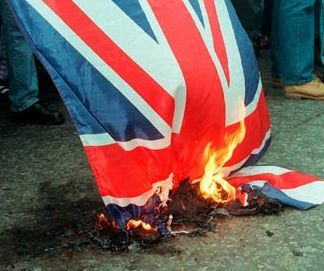 • 1: The UK along with all existing members of the EU lose their abstention veto in 2020 as laid down in the Lisbon Treaty when the system changes to that of majority acceptance with no abstentions or veto’s being allowed. • 2: All member nations will become states of the new federal nation of the EU by 2022 as clearly laid out in the Lisbon treaty with no exceptions or veto’s. • 3: All member states must adopt the Euro by 2022 and any new member state must do so within 2 years of joining the EU as laid down in the Lisbon treaty. • 5: The EU Parliament and ECJ become supreme over all legislative bodies of the UK. • 6: The UK will adopt 100% of whatever the EU Parliament and ECJ lays down without any means of abstention or veto, negating the need for the UK to have the Lords or even the Commons as we know it today. • 7: The UK will NOT be able to make its own trade deals. • 8: The UK will NOT be able to set its own trade tariffs. • 9 The UK will NOT be able to set its own trade quotas. • 22: The UK loses its right to call itself a nation in its own right. • This is the future of what the youths of today think we stole from them? • They should be on their knees thanking us for saving them from being turned into Orwellian automatons. Thank you for a clear picture of the future. The Commons and the Lords would of course continue to relax at our expense while acting as puppets for the EU overlords. Ask yourself is it right to produce a drama about an investigation whilst the investigation is still ongoing. Note the tool used is "drana" that allows the facts to be a little loose, it provides a get out for any critisism as to its content or motive. The BBC can be as subtle as a single frame cut into a movie to plant a subliminal idea. The Mueller investigation has so far produced NOTHING that is incriminating against Trump, and in my opinion the globalists know it never will.That is why they are getting their inuendo produced now before it passes its sell by date. On Sunday 3rd this "drama" is to be broadcast. When Hunter and Najib are given the job of looking into the proposed Trump Tower in Moscow, their investigation soon throws up some startling results - particularly in relation to Donald Trump’s personal lawyer Michael Cohen, the man who said he’d "take a bullet" for his Presidential client. This up-to-the-minute contemporary drama sheds light on a story that continues to unfold. Jonathan Myerson, award winning dramatist whose previous work includes The Republicans and The Clintons, unravels the story so far, following investigators as they uncover the truth behind Cohen’s dealings on behalf of the man known to the inquiry as Individual One. Robert Mueller's investigation is still ongoing, although it has produced several convictions already. The Special Counsel himself, former head of the FBI and a highly respected public servant, is an almost unknowable figure, shunning all publicity throughout his career and especially since being appointed to the Russia probe. Mueller: Trump Tower Moscow imagines the goings-on at the heart of the investigation. With Kerry Shale as Michael Cohen, Nancy Crane as Stormy Daniels and Nathan Osgood as Felix Sater, appearing alongside a group of invented characters playing the staffers on the Mueller team. The BBC is little more than stupid and ignorant lickspittles for whom the real "26" regard very much as useful, leftard morons. Much as they do about their Islamic foot soldiers. Both exploited and ignorant of their real positions as lackeys. Somtimes when a traveler finds the road has been blocked he must abandon his automobile and climb over the fence.